North Melbourne, Australia, September 6, 2018 – Bluefish444, manufacturer of the professional video industry´s highest-quality uncompressed 4K SDI, ASI, Video Over IP & HDMI I/O cards and mini converters, will be demonstrating Epoch and KRONOS video hardware with ClassX software at IBC Show 2018. ClassX LiveBoard is a robust broadcast graphics content creation and playout tool, allowing for fast and powerful 2D, 3D graphics within a single environment. With template-based graphics, real-time PIP effects, drag and drop interface, built-in automation and an incredible number of graphical plugins, LiveBoard is an all-in-one solution in the broadcast space. For the Epoch range, ClassX have implemented full support for audio, all available keymodes, multi-card and/or multi-channel workflows, and all 3G/HD/SD-SDI resolutions up to 4K 60p. This gives ClassX users the ability to utilise all features of Bluefish444 Epoch video I/O for their broadcast 3D graphics workflow. ClassX have integrated support for the forthcoming KRONOS range of video hardware by adopting the latest backwards compatible Bluefish444 v6 SDK, providing SMPTE 2022-6/2110 Video Over IP and multi-channel 4K 60p SDI I/O to ClassX LiveBoard. "Bluefish444 keeps developing and supporting an incredible range of top quality OEM products. 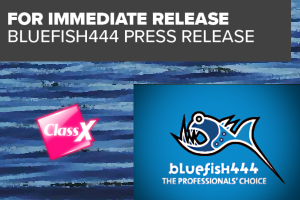 As early adopters of Bluefish444 solutions, we can count on a robust and productive collaboration," comments Michele Puccini, CEO at ClassX. "The KRONOS card has demonstrated to be the perfect match for our highly optimised graphics engines. Our customers always deserve the best performance available." Bluefish444 will be demonstrating the KRONOS Optikos video I/O card, outputting a SMPTE 2110 uncompressed IP stream via 10Gb Ethernet and HD-SDI simultaneously. The HD-SDI video will feed a ClassX system running LiveBoard for low-latency graphic overlay. This is a typical workflow during live events and broadcast for channel branding or graphic overlays over a live video feed. "Integrating ClassX Broadcast systems into the Bluefish444 IBC 2018 exhibition is a great example of the breadth and flexibility of Bluefish444 hardware, software and 3rd party integrations," said Tom Lithgow, Bluefish444 Product Manager. "This demonstration shows how Bluefish444 KRONOS can enable SMPTE IP workflows and simultaneous SDI workflows into professional video solutions from Broadcast Graphics to NLE systems." ClassX offers a wide range of products and solutions, from 2D/3D graphics template editors to media-rich playout systems. All software modules are developed on an open architecture and design. Based on industry standards and designed to allow maximum customization of a Broadcaster´s workflow, the ClassX platform features high-end live and automated graphics solutions, distributed architectures and seamless integration among all areas with selected third-party technologies. Bluefish444 is the manufacturer of the industry´s highest-quality uncompressed 4K SDI, ASI, Video Over IP & HDMI I/O cards for the Windows, macOS and Linux operating systems. Its I/O cards are used in broadcast, feature film and post-production markets for editing, animation, compositing, colour correction, restoration, digital intermediate, 3D and IPTV applications. Bluefish444 cards have been used on award-winning feature films, commercials, music videos and sports events worldwide. Bluefish444´s range of video cards are incorporated in video servers, encoders, decoders and character generator solutions by numerous 3rd party OEM manufacturers, in addition to other niche & mainstream applications.